Was hoping they had something in here on it but I don't see anything. yeah I checked there first and seen nothing. -max turbine speed is rated in terms of "tip speed" and 560/ms. The specific RPM that 560m/s tip speed occurs depends on the diameter of the specific compressor wheel in question. -oil pressure is regulated by the built in oil control orifice. Pressure range is stated as 30-100psi. we've had motorcycle and ATV customer engines at 15-20psi oil pressure and no issue surprisingly. -bearings are m50 races with ceramic balls in aluminum cages (silver plated). Dimensional Tolerances are considered BW proprietary information and not shared outside of their internal engineering center. -most of the EFR compressor wheels have 14 blades which corresponds to 2917 Hz (except the 6758 which uses a 12 blade wheel)"
prior to that, running Motul 5w-40 I only had a 3 ppm silver content and I was hard on the turbo for those 3 months I ran motul. nothing changed between mechanical wise between the Motul and the RLI 5w-40. my motul was 1160 zinc. Hmm, are you switching back to Motul? If you want lower zinc, yet really good oil, 300v substitutes their zinc with boron. 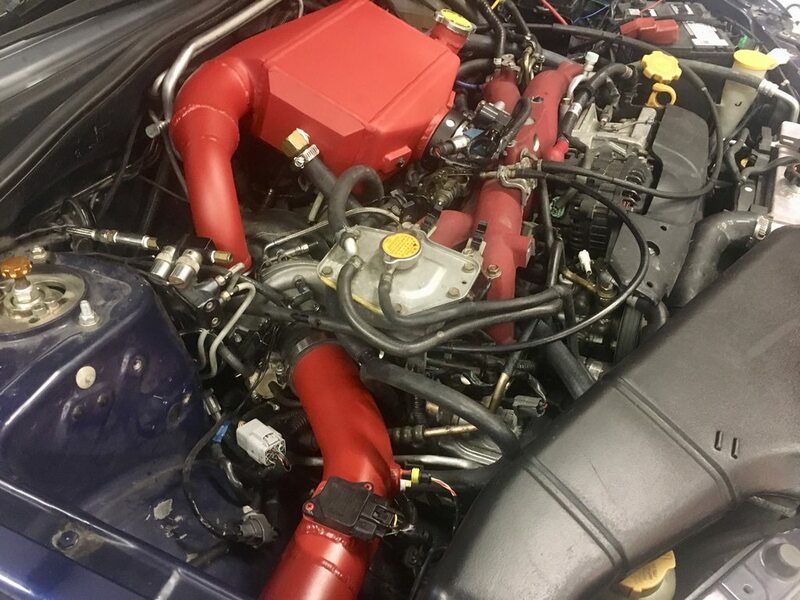 Not sure if this has been mentioned before in the thread, but I’ve got an IRL EFR7163. I should be able to swap the compressor housing out for a standard one so that i can fit a filter/inlet on there, correct? Much cheaper than machining a flange and inlet piece. Yep. 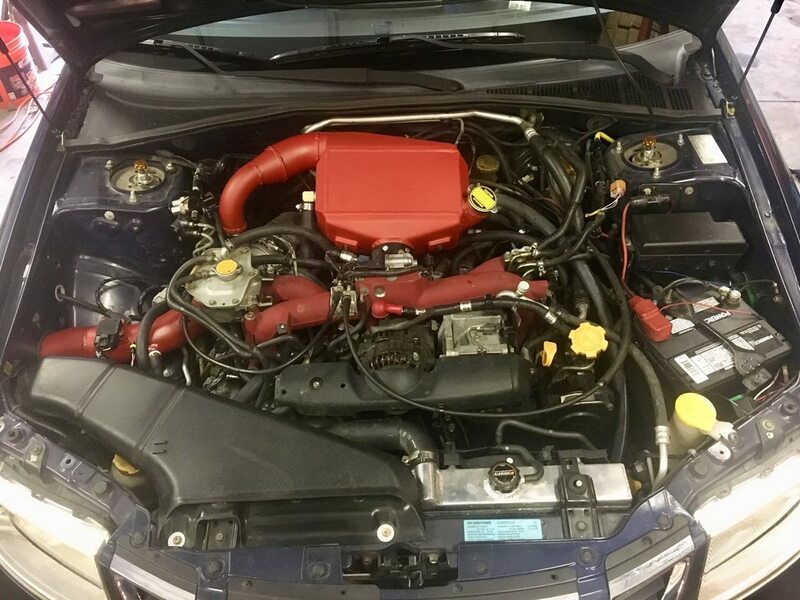 I was going to do the same thing with my stock location 7163 so I could get the bigger inlet. anyone wants to trade housings? Good, because i already bought one. The Saabaru rotated kit is all buttoned up. 7163TS IWG, AWIC, vanjen clamps, etc. Waiting on Johnson Tuning to start with the e-tuning. 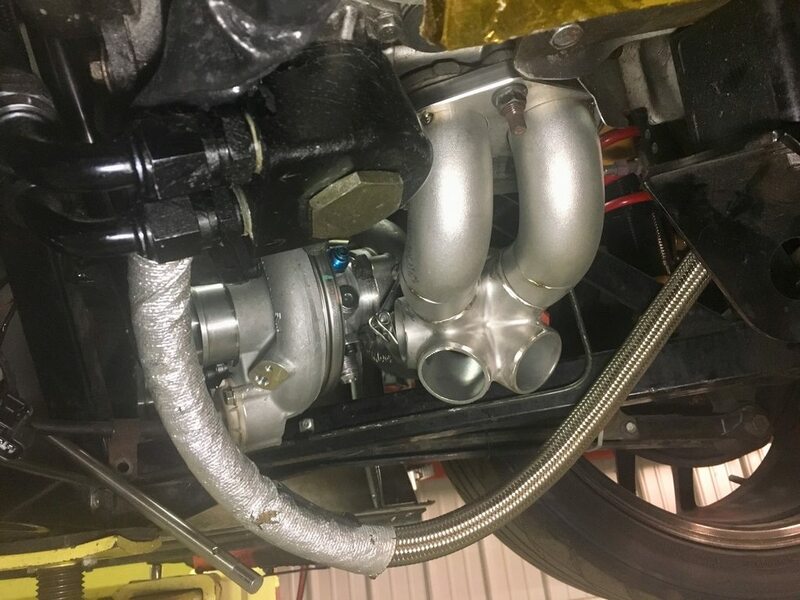 My FFR 818's new low mount 7163 SS EWG manifold is starting. Will be interesting to see how it works this time around with substantially unequal length runners. 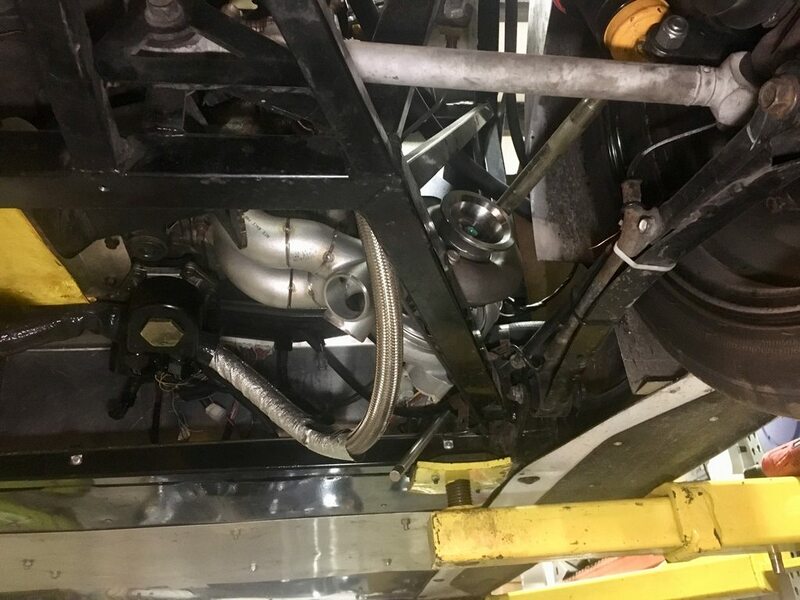 The dry sump pan and tube chassis are helpful for packaging. I went ahead and pulled it up on Virtual Dyno out of curiosity and this is what DynoJet numbers spit out. I compared it to a 2.5XT-R I did on the same day. One thing I do remember, when my car was selected on the dyno, it listed my weight at something like 3,6xx lbs. I'm starting to think that had a roll in this? EDIT: Someone posted a picture after my first pull... The weight is definitely wrong, but I also feel like the HP @ 50 MPH seems high as well. 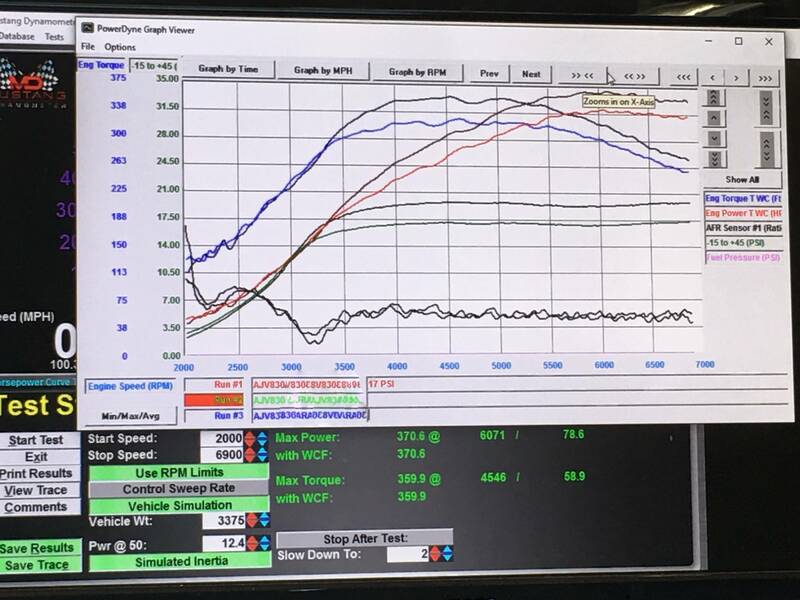 Anyone else have this data on their car running on a Mustang Dyno? I happened to stumble on this from Krang's thread... My numbers are low because my vehicle simulation numbers were high, and I thought they were. Does anyone have any comparison of the 7163 prototypes vs the current production units? I have one of the prototype units that I picked up brand new 6 months ago and am loving it but would like to know if there is any considerable difference between the two later in the powerband? I am considering selling it and picking up a production version if there is much of a drop. The prototype had a smaller hotside and slightly less aero on the wheel. The current production 7163 only comes in the bigger hotside (.85) and has several wheel updates. If you have one of the .64 ones I might be interested. 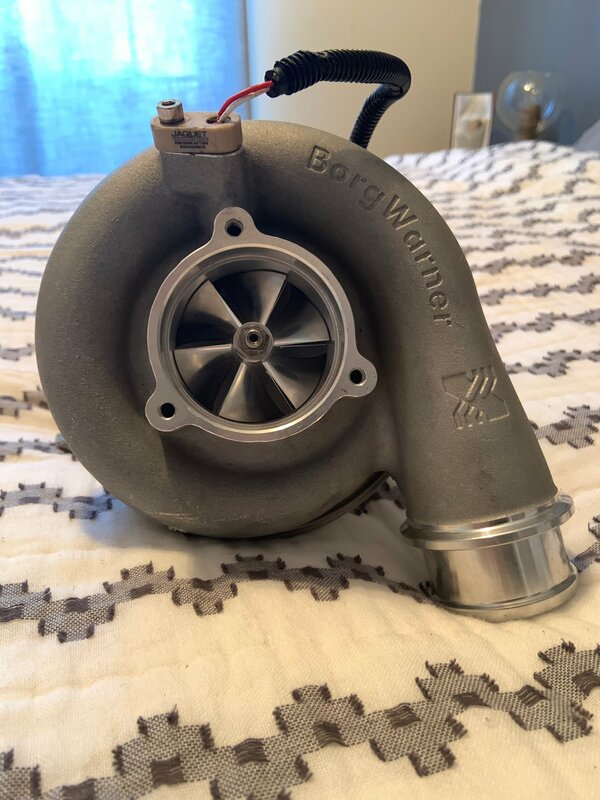 .64 AR would be nuts on this turbo. Due to altitude, we can get away with smaller AR housings so I wonder how a .64 would do at my altitude. did you build your own kit for the 92x or buy something off the shelf? I am wrapping up my engine build and decided that while I have everything apart that I want to convert my 7163 from IWG to EWG. I am wondering if anyone has any good pictures of the stock location uppipe installed that they could share with me so I can plan the flange placement?